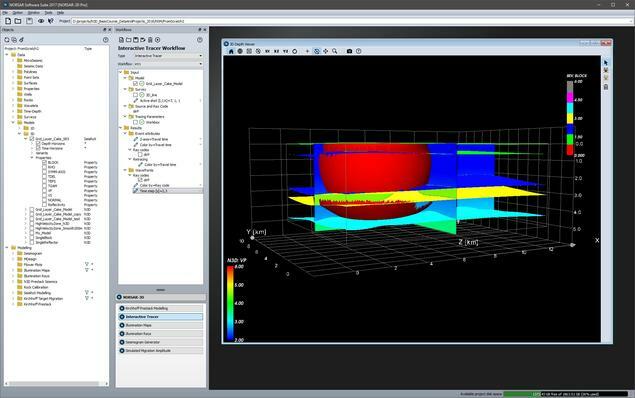 NORSAR Software Suite is a common framework for NORSAR software and consists of NORSAR-3D, SeisRoX, and MDesign. The new NORSAR-3D is available in three different configurations: Basic, Pro, and Expert. NORSAR-3D Basic is part of NORSAR-3D Pro, and NORSAR-3D Pro is part of NORSAR-3D Expert. NORSAR-3D 2017 features a novel NORSAR-3D Pro version which is now available for both Windows and Linux. NORSAR-3D Pro 2017 includes the Basic version and in addition a comprehensive set of tools and workflows to build complex models and do illumination studies and survey planning for any type of acquisition geometries. Major new features in this version are: A complete new interactive 3D Model Builder for creating from simple to complex 3D models, a redesigned intelligent Ray Tracer workflow to study wave propagation in detail, and improved workflows to generate Illumination Maps and Synthetic Seismograms. In addition an innovative batch system is included for distributed parallel processing of large simulation jobs on a cluster of Windows or Linux machines. NORSAR-3D Basic is designed to perform kinematic illumination studies for any type of acquisition survey. Model elements, like surfaces and elastic properties, can be imported or defined, and user-friendly model builders can be used to set up model geometries and elastic properties. The software contains the modelling tools Illumination Rays and Illumination Maps and runs on Linux and Windows. The basic version allows the user to import model elements, e.g., interfaces, property grids and cubes, point sets and polylines, as well as surveys files in the P1/90 and SPS formats. Single Block Model Builder: When interested in traveltimes or amplitudes for direct waves only, a single block model can be used. Here single property cubes, either generated in the software or imported, are used to define the elastic properties. Single Reflector Model Builder: In order to generate Illumination maps a target reflector is required. The model properties above and below the target reflector can be set by either selecting property cubes or set to constant. Grid Layer Cake Model Builder The grid layer cake models can contain various surfaces which separate the different layers. The property values are either constant or gradients. Illumination maps show how well a target horizon is illuminated by a survey. The basic map is the hit map, which displays for a specific survey how many rays from shots to receivers reflect on the different parts of the horizon. Shadow zones clearly stand out on hit maps. This workflow generates synthetic pre-stack seismic data including diffractions and noise based on the Kirchhoff process. These results can be used for PSDM simulation, processing test, and velocity sensitivity studies. Current implementation is limited to primary reflections, but for rather complex sets of target horizons. The Reflectivity Viewer allows you to view the reflectivity profile for a given impedance contrast as a function of incident angle. Synthetic seismic data generated in a workflow can be exported to SEG-Y files. Other workflow results are exported as ASCII format. In addition to the 3D viewer, a 2D viewer is used to display synthetic data and event attributes such as traveltimes and amplitudes. NORSAR-3D Expert is currently available on Linux. NORSAR-3D Expert includes the Pro version, and in addition it provides unlimited batch processing capabilities and access to the project results to do in-depth analysis or tailored applications. Very complex models can be made in the Expert version, in that model elements can be edited on a very detailed level. Main new feature in this version is the introduction of the Kirchhoff Target migration workflow. Furthermore, this new version supports the extraction of S-wave anisotropy parameters from calculated event sets. Kirchhoff Target migration workflow is introduced. It can be used to generate migrated sections from Kirchhoff pre-stack data. This workflow can be used for e.g., velocity sensitivity studies. The Event Attribute Extractor provides very flexible export functions. Detailed ray-tracing results can be exported on ASCII files.